(3) The appropriate pilot type rating for the aircraft unless the flight will be conducted as domestic flight operations within United States airspace. (1) The person who provided the training must sign the applicant's logbook or training record after each lesson in accordance with §61.51(h)(2) of this part. In lieu of the trainer, it is permissible for a qualified management official within the organization to sign the applicant's training records or logbook and make the required endorsement. The qualified management official must hold the position of Chief Pilot, Director of Training, Director of Operations, or another comparable management position within the organization that provided the training and must be in a position to verify the applicant's training records and that the training was given. (3) If the applicant's flight experience and/or training records are in an electronic form, the applicant must present a paper copy of those records containing the signature of the trainer or qualified management official to an FAA Flight Standards District Office or Examiner. (4) The applicant must complete and sign an Airman Certificate and/or Rating Application, FAA Form 8710–1, and present the application to an FAA Flight Standards District Office or to an Examiner. 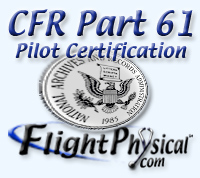 (5) The person who provided the ground and flight training to the applicant must sign the “Instructor's Recommendation” section of the Airman Certificate and/or Rating Application, FAA Form 8710–1. In lieu of the trainer, it is permissible for a qualified management official within the organization to sign the applicant's FAA Form 8710–1. (6) The applicant must appear in person at a FAA Flight Standards District Office or to an Examiner with his or her logbook/training records and with the completed and signed FAA Form 8710–1. (3) If the applicant's flight experience and/or training records are in an electronic form, the applicant must provide a paper copy of those records containing the signature of the trainer or qualified management official to an FAA Flight Standards District Office, an Examiner, or an Aircrew Program Designee. (4) The applicant must complete and sign an Airman Certificate and/or Rating Application, FAA Form 8710–1, and present the application to an FAA Flight Standards District Office or to an Examiner or to an authorized Aircrew Program Designee. (6) The applicant must appear in person at an FAA Flight Standards District Office or to an Examiner or to an authorized Aircrew Program Designee with his or her logbook/training records and with the completed and signed FAA Form 8710–1. (4) Designated as a safety pilot for purposes required by §91.109(b) of this chapter.